Retinal vein occlusion is a condition where one of the blood vessels in draining blood from the retina becomes blocked. The causes of this can include high blood pressure, atherosclerosis (hardening of the blood vessels), blood clotting disorders, high cholesterol, diabetes and other rare problems like inflammation inside the eye. There is usually no pain in the eye when a retinal vein occlusion happens. There is usually no redness in the eye either. Over time the retinal haemorrhages will fade. However the damage can continue due to blood in the retinal layers. Treatments are available to reduce the damage in the eye. Most of the time, the treatments cannot reverse the damage to the eye. In most cases, measures can be taken to reduce the eventual damage (damage limitation). These decisions can be complex and depend upon the type of retinal vein occlusion. Please ask your doctor regarding your treatment options. Mr Saeed specializes in the treatment of retinal eye diseases. He regularly performs assessments and treatments for retinal vein occlusions, diabetic retinopathy, diabetic maculopathy and other retinal diseases. Mr Saeed also treats retinopathy with lasers including mono-spot laser, multi-spot VALON laser and the latest multi-spot PASCAL lasers. He also treats diabetic retinopathy with non-LASER methods like intra-vitreal injections of Lucentis, Avastin, triamcinolone or intra-vitreal implants like Ozurdex. 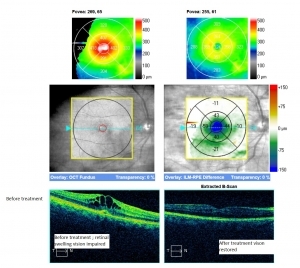 Mr Saeed will assess you and work out a tailor made plan for your level of retinopathy. You may have retinal photographs and scans to document your retinal condition. Mr Saeed will then explain your level of retinopathy. If you need a monitoring of your eye disease a further appointment may be scheduled. However if you need treatment, this will usually require laser or injection treatment. There may be many advantages to going private. You get your treatment at the time and date you want. Your treatment can be scheduled most days of the week.